The bridal shower wishing well was started years ago as a way to help the couple build their stock of small household items. This tradition has become a standard part of most wedding showers. But as you'll see, there's more than one way to "fill the well". You may want to personalize this idea, by requesting that guests bring items that go along with your theme. 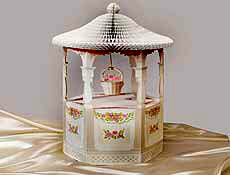 Smaller items are often chosen by the couple when they fill out their bridal registry. Guests may be able to choose something from this list. The following is a list of suggestions for smaller and/or less expensive items that would work with a specific theme. • Kitchen...small gadgets such as teaspoons, measuring cups, and oven mitts. • Bath...bath soaps, guests towels, or a night light. • Garden...seed packets, gloves, hand tools, kneeling mat. • Tea Party...tea bags, a strainer, tea cozy. • Travel...luggage locks, luggage ID, journal. • Handyman...screwdriver, hammer, duct tape. • Crafter...glue gun, glue sticks, stamps and ink pad. • Beach...suntan lotion, water bottle, sunglasses. • Spa...votive candles, nail polish, yoga cd. These are just some of many theme ideas. Adjust to your own party style. You can make this item more unique by choosing a holder that reinforces your theme. • Kitchen...use a large wicker basket, or a kitchen trash can. • Bath...a hamper to match bath accessories. • Tea Party...pretty basket decorated with flowers or lined with linens. • Beach...beach bag, picnic basket, or a cooler. • A plain basket will work well with any theme. Add a bow that goes with the party colors to bring it together with the rest of your decorations. • If you have a large guest list, and your holder idea is on the small side, consider using two. • Some of the containers listed above, are more expensive than others. For example, the hamper itself, is a bigger gift. Plan ahead. The bridesmaids could give this as part or all, of their present. • Have guests attach a small tag to their gift, with a saying or special wish for the bride or couple. • Go from bridal shower wishing well to the homepage.